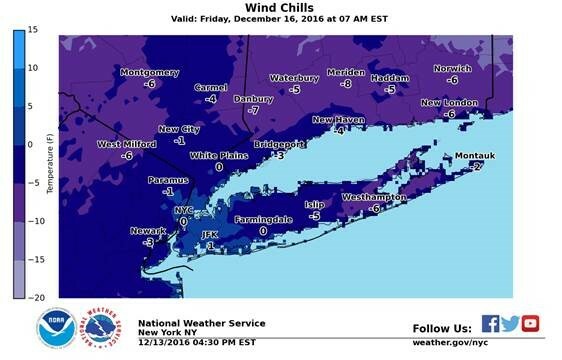 From the Nassau County Office of Emergency Management: Hi folks — The coldest temperatures and lowest wind chills of the 2016-17 winter season are expected Thursday through Friday. • Thursday: Highs in the 20s. Wind chills of 0 to 10 above. • Thursday Night into Friday Morning: Lows 5 to 15 above zero. Lowest wind chills 0 to near 10 below zero. • Friday: Highs 20 to 25. Wind chills moderating.